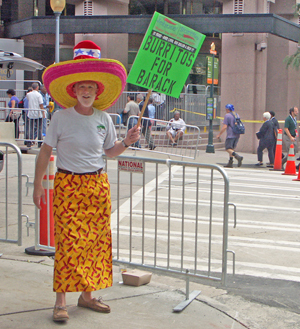 Thursday was an interesting time for me walking about the final day of the DNC - Democratic National Convention. Although I was limited to the periphery of the event I felt I still got a sense of what a national convention to nominate a presidential candidate is about. For the thousands of delegates that arrived here in Charlotte it must have felt like a vacation. 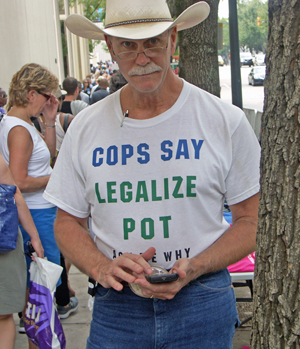 Most of them receive no pay for the many hours they devote to party activity in their home state. This convention is their reward and they enjoyed all the sight-seeing, shopping, and the hours spent watching each other watch each other. They talked up a storm and everyone seemed in a wonderful mood gaggling about and chasing down their favorite political personalities for a picture. 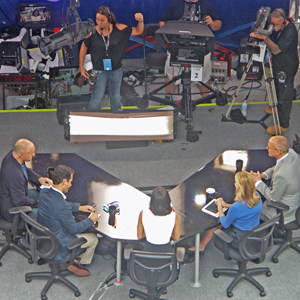 The Epicenter was the media center for much of cable television’s coverage of the Democratic convention. 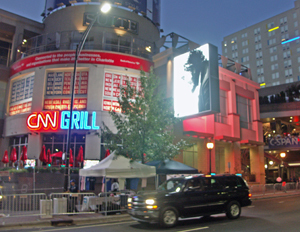 Entry into the CNN Grill was by invitation only – off limits for me. The picture was taken shortly after six in the morning when I first arrived. 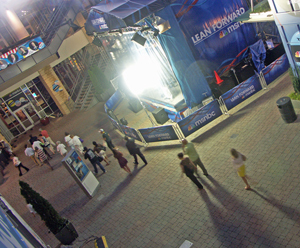 MSNBC dominated the inner concourse of the Epicenter. The stage with the protective plastic curtain still in place is where many of the live programming originated. The program Morning Joe with Joe Scarborough was telecast from the Blackfinn Saloon which is out of the picture and off to the right, on the second floor. During Thursday’s show former NBC anchor Tom Brokow took ill. Paramedics were called. He was very unsteady. He was taken by ambulance to a nearby hospital. It was later released that he had suffered a negative reaction to the sleep drug Ambien. His wife has probably been telling him to slow down. I can hear her saying, "Didn't I tell you something like this would happen?" 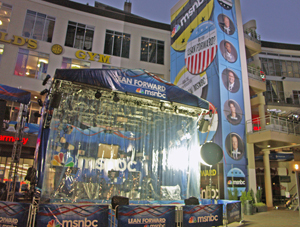 Early morning risers head to the MSNBC Experience, located across from the outdoor television stage. 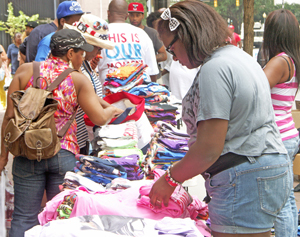 Here you could get coffee along with other refreshments as well as participate in a number of promotional activities. They had large bowls filled with campaign-like buttons, featuring pictures of all your favorite MSNBC personalities. Since I only had a T-Shirt pocket I figured I’d come back later in the day to collect a few. Unfortunately they never refilled the bowls as they ran out. Everyone was gone… except for Ed Schultz. They still had full bowls with his picture. Poor Ed. 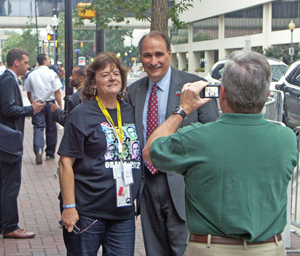 David Axelrod, President Obama’s senior political advisor, poses with a delegate. 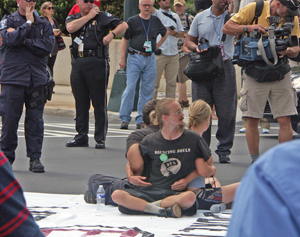 The convention area in uptown Charlotte was so compact that most everyone walked to wherever they were headed. Political figures and television personalities alike were repeatedly stopped for pictures making remarkable patience a necessary virtue. 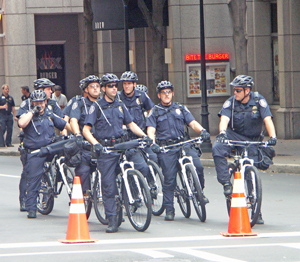 Security was very tight in the convention area. Purses and bags of any size were checked for contents and cars had their hoods and trunks popped for inspection, as well as a bomb-sniffing dog used to insure the vehicle was safe before proceeding. Trucks were routed away from the area and parking garages were often left empty. People normally filling the city’s office towers stayed home. 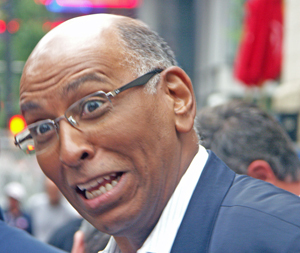 Michael Steele, former chairman of the Republican National Committee, reacts to a greeting from a passer-by. He is a very personable man and he exhibits real joy at being acknowledged by a complete stranger. He has just finished a three hour stint on Morning Joe and he was heading to breakfast. He is so delighted to see you. Please, let’s exchange pleasantries for a minute. Democracy rewards many political figures with this remarkable gift of finding you the most important person at this very moment. 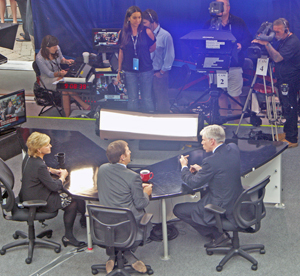 MSNBC political reporter, Chuck Todd, center, talks with Meet The Press host David Gregory while North Carolina Governor Bev Perdue looks on. The young woman directly above Todd is the Floor Director. She is responsible for every aspect of the set, from signaling when the show is live, to identifying which camera is being used, to encouraging the audience when to cheer and applaud. She even makes sure the set is always properly groomed. 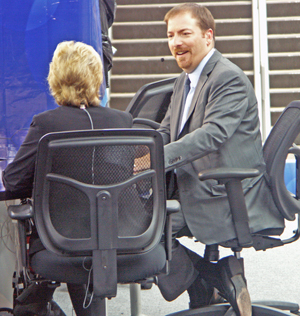 Chuck Todd turns his attention to Governor Perdue. Following each commercial break Todd was dealt an entirely new group of politicians, reporters and analysts. It’s his responsibility to be well versed in the subjects of importance to his guests and to keep the discussion focused, relevant, fast paced and interesting to the viewer. He must also have the quick fortitude to graciously handle the occasional prickly personality of those being interviewed. 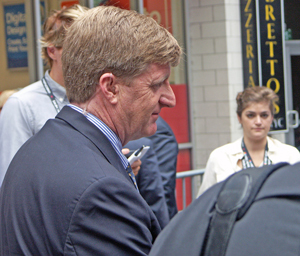 Patrick Kennedy, former Rhode Island congressman and son of the late Senator Edward Kennedy talks with another guest waiting to go on-air while back stage in an area that serves as the ‘Green Room’ for MSNBC. The Kennedy name remains a potent emotional force in Democratic politics and he spoke before convention delegates on Tuesday night. 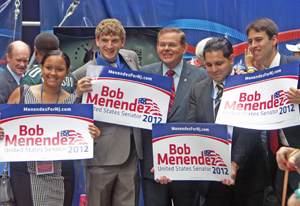 Candidates such as New Jersey’s Robert Menendez, center, find conventions important in getting much needed television exposure, schmoozing big money donors and firing up the most politically active members of your party. 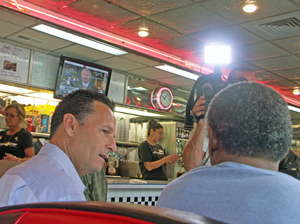 Even as I sat in a local diner for a breakfast of eggs and hash browns I could not escape the crush of TV crews searching for interviews. Here a Fox TV reporter came over to interview a political activist in the booth behind me. 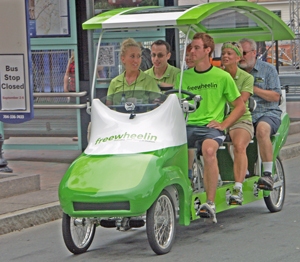 Some convention goers opted to get about town using these freewheelin taxi devices where everyone chips in with their own pedal energy to get them where they want to go. 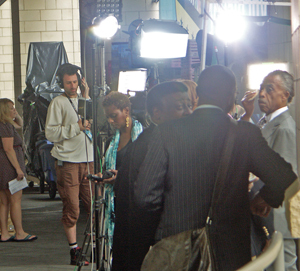 The Reverend Al Sharpton gets a last minute touch up in his cramped studio space just prior to air time. 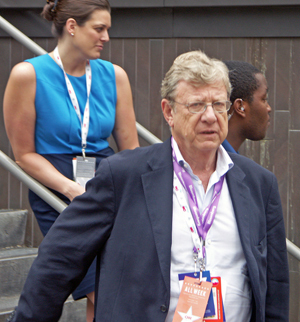 Jeff Greenfield, a reporter with an intellectual bent and wry humor, did analysis work for CNN but also made an appearance on MSNBC’s Morning Joe. Following his appearance on this occasion he made his long walk through the center of town to his modest motel room, interrupted only once - recognized by an older couple enjoying their breakfast at a table outside an eatery. 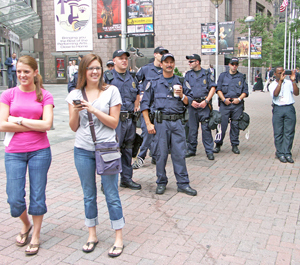 This crowd gathered to enjoy a robotic dance-type performance put on by a talented cop assigned to direct traffic in the center of town. Hosts change, guests come and go but it’s going to be a long day for the Floor Director and her crew. 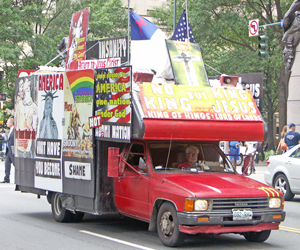 National political conventions are a natural beacon for people having a passion for their alternative convictions. Street vendors were plentiful and they would sell you colorful shirts, buttons, posters, an Obama hand puppet, and even Obama air freshener for your car. Not all messages were strictly political. 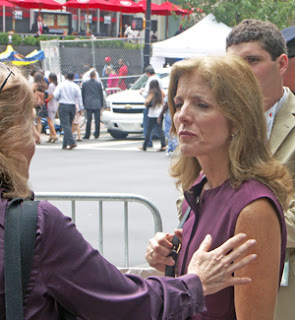 President John Kennedy’s daughter, Caroline, arrived to talk before the convention later that evening. I didn’t ask but I’m sure he had a compelling reason. 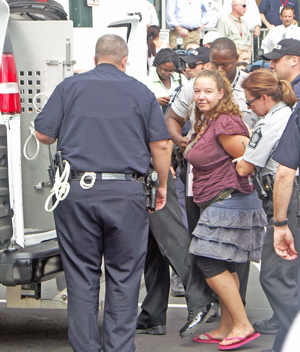 Free speech was allowed to resume in the back of a police van. 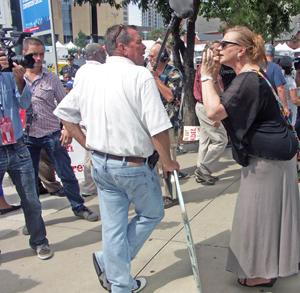 A heated exchange erupts on the street over abortion and a woman’s right to choose. 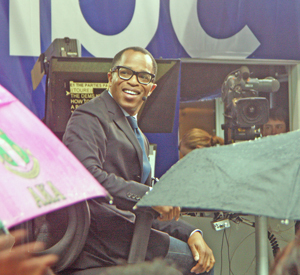 Afternoon rains drenched the crowds but for journalist and MSNBC contributor Jonathan Capehart the show must go on. I know how petty and cynical election campaigns often look but there is a greater, noble purpose to it all and the party activists, politicians, reporters and television personalities here seemed genuinely energized by being part of the mix that becomes a small part of history. People ask what purpose the party conventions serve when primaries decide which candidate gets the nomination. I don't know. 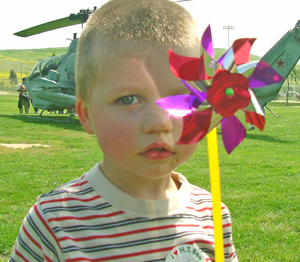 Do we need a terribly rational reason for holding such a wondrous gathering and colorful event? Somehow it still works for me.